Our product range includes a wide range of elastic wrist splint, wrist brace with double lock, wrist brace with thumb, tennis elbow support, forearm splint and hand resting splint. Our dominance over the market as the prominent wholesaler and supplier is largely attributable to our exclusive range of Elastic Wrist Splint. This wrist splint is well tested on several parameters of quality for ensuring its excellence. 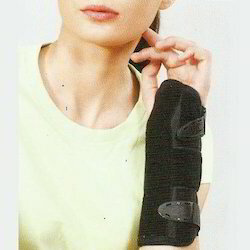 Our wrist splint helps in customized fitting and achieving required degree of dorsi-flexion. As well, our wrist splint has best in class elastic that ensures adequate compression, strong support and durable product. We are the noteworthy wholesaler and supplier of Wrist Brace with Double Lock. The available wrist braces are manufactured under the direction of vendor’s professionals using supreme quality material following set standards. These wrist braces have double locking ensure stronger grip, better fitting and universal sizing. Customers can easily avail these wrist braces from us on diverse sizes & it is comes in one piece fits both hands. By focusing on variegated demands of our respected clients spread all over the country, we are offering Wrist Brace with Thumb. This wrist brace is checked on numerous parameters in order to supply a defect free range to customers. Our wrist brace is manufactured using high quality material and sophisticated technology in fulfillment with the set industry standards. Besides, the offered wrist brace allows free movement of the thumb & fingers. Supported by our hard working professionals, we are also involved in the wholesaling and supplying Tennis Elbow Support. The elbow support is valued in the market owing to its optimum quality. 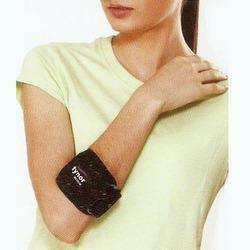 Offered elbow support is inspected on varied parameters in order to supply a flawless range. Our vendors manufactured this elbow support using excellent quality of material & contemporary techniques by vendor’s highly skilled technocrats as per the norms of industry. Extra long & strong, dorsal& volar splints ensure good immobilization. Customizable aluminum, splints ensure perfect fitting & enhanced comfort. PUF lined matty fabric body ensures durability, improved comfort & better aesthetics. Two part, amphi- dextrous design allows customized compression and ease of use .One size fits all. Anatomically designed to immobilize the wrist, fingers and the thumb in the functional or neutral position. Molded from high quality polymer with high impact strength. Removable PE foam, finger separator provides extremely comfortable resting area & keeps the fingers separated, ensuring no contractures in burn patients. Soft padded tapes provide comfort, good feel and are easy to wear. Made of breathable PUF fused fabric which ensures excellent aesthetics, comfort and a long life. Removable and malleable splint ensures good immobilization, helps in customized fitting and achieving required degree of dorsi-flexion Top edge abuts the palmer crease to allow free hand and finger movement. Long length of the brace provides enhanced immobilization and quick relief. Bi-layered construction, dermophiiiic cotton ensures, comfort in all weather conditions. Nylon outside ensures long life, excellent aesthetics & color fastness. Four way stretchable knit with "Spandex" provides effective compression, & grip. 3 Dimensional knitting provides zones of high compression and no compression for excellent effectiveness. Thick knit retains therapeutic warmth, & provides assuring support. Pleasing aesthetics is an added advantage. Looking for Wrist & Forearm ?